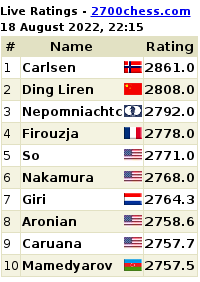 Magnus Carlsen of Norway and Levon Aronian of Armenia are still tied for first place after eight rounds at the FIDE World Chess Candidates' Tournament in London. The leaders of the tournament faced each other over the board on Sunday and drew a Catalan game in just an hour and a half. Vladimir Kramnik of Russia, who beat his compatriot Peter Svidler in a Grünfeld, is now one point behind the two. Like Kramnik, Boris Gelfand of Israel won his first game of the tournament. He defeated Teimour Radjabov of Azerbaijan by adopting the strong positional concept 13...e5! in an English game. For the third time already in this tournament, Ukrainian Vassily Ivanchuk lost on time, in this round against Alexander Grischuk of Russia. On Sunday the second half of the FIDE World Chess Candidates’ Tournament started with a big game: Magnus Carlsen versus Levon Aronian, the two leaders of the tournament. In the first round they drew against each other, and if either player would have won this one, he would have been “huge favourite”, as Carlsen put it the day before. One reason is that if two players tie for first place after the last round, the first tie-break rule is the individual result. As the players explained, such quick draws are part of the game: “As in the whole tournament, you don’t really want to lose any game, but this one particularly. In this tournament situation it would mean a lot. 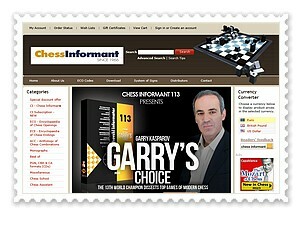 You have to try and take your chances when you can,” said Aronian. “In general with Black in such tournaments that’s the way you play. You try and play solid and if there are chances, you take them, otherwise… You know, the players here are so strong that it’s not easy to win any game,” said Carlsen.